Things are missing around this house. Water bottles. Dishes. Trays. Mail. Benches. Sweatshirts. Backpacks. Boxes of crackers. Yarn. Pruning shears. Small chairs. Pets. I don't blame them. It's like a snow-colored wonderland. They've taken those pruning shears and carved themselves a tiny home among the soft balls of white loveliness. There's a whole village underneath those branches. Things that are secrets, things I'm not allowed to see (that would probably be the missing yarn, I'm guessing.) Things hanging, things stored in piles. Special seats for company. There's even a toddling two year old who delivers the mail. I spent some time out there myself just yesterday. Not huddled under the bush mind you–because there are secrets in there. But they gave me a special bench just outside the door. 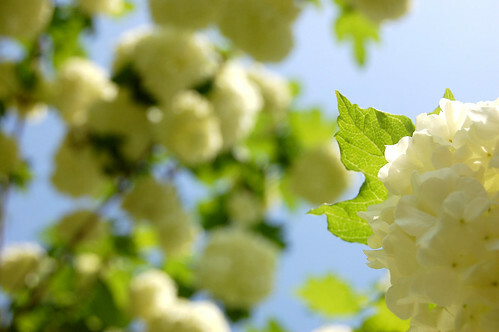 So I took it upon myself to soak up some sun, listen to their chatter while they thought I was sleeping, and allow little hands to cover me in velvety white blossoms. I swear, it was like a spa treatment. On Monday, Mary went to the doctor and was diagnosed with migraines. It's a long, drawn out back story, but I'm just wondering if any of you have any experience or children struggling with this. The doctor said her symptoms were classic. I never even knew children could get migraines. Right now, we're trying to treat it with diet changes, ibuprofen, hydration and catching the symptoms early. I'd love to know if any of you have any experience. My brother had them as a teenagers, it’s very common especially for teenage boys. I’ve never heard of children getting them, I really feel for Mary.The doctor gave him some migraine pills and said to avoid cheese and chocolate. i used to get migraines as a child, and get them less frequently now as an adult. i’ll email you later molly. Hi Molly. I’m going through something similar with my ten-year-old right now. But no diagnosis yet. I’d certainly like to take care of things with diet, etc…Good luck, and I hope we both make some healthy, happy progress.Beautiful pictures. I love that last one-sweet girl. Molly, I get them- but mine started at 15. Mine begin with ocular spots and progress from there. I’ve found that they sometimes happen when my blood sugar is too low, so if I start the day with proteins and have protein snacks, I do better. Lots of water helps too. Last month I had 3 or 4 over 3 days. I don’t know what I’d do if N had them. Molly I have a friend whos son has the same problem with migraines. His are triggered by things such as food preservatives and stress. She has found that a diet change really helps. You can google to find a list of common triggers. She is a mutual friend and I will e-mail you and maybe you can talk to her if you want. i get migrianes – my sympathies! basically, ditto what melissa said. a friend of mine gets migraines that present themselves as vertigo (not as common, i guess), and a specialist at johns hopkins gave her a LONG list of foods to avoid/limit. she’s having much better luck now, as she figures out what she can and can’t tolerate. as for me, i find that exedrin migraine (and a dark room) is the only thing that works…maybe they have a child version? My 7 year old nephew gets migraines pretty often. One trigger for him is sleep. If he doesn’t get enough sleep or sleep well he will almost always get a migraine. Good luck with your little one. oh the poor love! i have migraines..with flashing lights, slurred speech, pins and needles in my tongue and the maddest headaches! but not so often now as i learned my symptoms which may be personal to me but… if i go back to sleep after waking i’m guaranteed a bad one..medication that contains codeine or makes you drowsy has the same effect for me, humidity..like when it needs to thunder and doesn’t, and some strip lights in shops. i know now within seconds if the light is ‘good’ or ‘bad’ and have to leave if it is.i had an attack once at work and my boss thought i was having a stroke.hope you can get to work out marys triggers soon…i’m not sure if its a myth but french onion soup was recommended to me to soothe an attack.when i’ve got less kids around my feet i’ll email you some links i’ve used. One thing I recommend to patients to try and help find triggers is keeping a diary- with foods, activities (especially changing environments or time at computer, etc. ), hours of sleep, and just anything different. I had one patient find that peppermint was hers and when she cut that out, they went away. Not everyone is so exact, but it’s worth a try. I’m sure you’ve already done this, but have an eye exam to be sure too (not that poor eyesight causes them but could contribute). I know they must be horrible, especially at such a young age! Bless her heart. Yes, I have some experience with this as I have struggled with them since middle school. After discovering my triggers and (and my cure) I only have one year or so. For me, doughnuts and/or orange juice on an empty stomach is a sure-fire trigger. I’ll get one every time. Something about the perservatives or the acidity…not sure which. Also, flashing or flickering lights will bring one on in a heartbeat. I nearly always have the visual aura before the pain and discovered that taking two extra-strength bayer aspirin, applying ice to the back of my neck, and sipping some caffiene usually stops mine in it’s tracks. Ibuprofen and acetomenaphin do nothing for me but after doing research, I’ve found Asprin to work effectively every single time. You’d have to check with your doctor though since aspirin is typically NOT recommended for children. I have had migraines since I was 13. Mine are triggered by lack of sleep, lack of water, red food dye, low blood sugar and hormones in milk. When I was expecting my first daughter I got them with nose bleeds- my OB told me too much estrogen…. Since I was Pregnant I couldn’t take any meds for the migraines they recommended a small cup of coffee or a can of cola. When I feel a headache coming I drink a cola drink- I get a little salt, liquid, caffeine and sugar all at once and I don’t have to take any meds.I really feel for you- best of luck! I’ve been getting migraines since I was 8. They usually start with ocular distortions – I get blind spots and if I don’t take some preventative measures, the headache comes on within 24 hours. Ice packs around my head are the only thing that can help once the headache starts. I feel so bad for your daughter (and you). I remember lying in my bed, sobbing, because I was in so much pain. I’ve tried the medications, but they make me very loopy. One time, I had taken the meds to fend off a headache, and I was packing to go to my parents’ for a few days. At some point, it started to make sense to me that instead of taking my clothes out of the dresser drawers and putting them in a suitcase, I should just take my whole dresser. I had actually moved the dresser half-way down our stairs when my husband came home and talked me down. I have no doubt that if he hadn’t come home when he did, I’d have had that dresser in the back of our truck and driven 8 hours to my mom and dad’s with it. thanks, tara. I have to admit, it took us awhile before we broke down and took her to the doctor. I thought it was just hunger-related, but they started getting more frequent and more debilitating. Now I feel badly that we didn’t get her in there sooner. But I’m glad to have some tools to help her. Good luck with your ten year old! thank you for your ideas. I think i really need to track preservatives for her and watch that closely. I do believe she’s pretty sensitive to what she eats, so there may be something in her diet that is triggering them. I love those bushes, there were tons of them in Germany. I can’t believe I don’t have one in my yard! sorry, I posted before I was done! So sorry to hear about her migraines. My DD gets headaches and I was told she would probably get migraines as a teenager. So far so good. I know they can be awful, but I have no personal experience. I just hope you’ll find something that will help her! Oh ‘m so sorry about migraines. I’ve had two in my life and I can’t imagine being a child and going through that. Hope your natural changes work. Seems like the fresh farm air, hard work, and good rest at night are good for a body too. Blessings. Poor thing! I have suffered from migraines since I was a teen, still get them but less frequently. It is a hard thing to suffer from, because the pain can be so intense, debilitating and yet, there is nothing visible for people to see the amount of pain you are in. I hope I am explaining this clearly. I remember I once had a CAT scan of my head to rule out any serious problems, and I almost wanted something to show to prove that I was in pain. The only advice I can give is to understand that they are real ( I’m sure you already do that, you’re her mom! ), once a headache starts, take your medicine, lie down in a cool, dark room and try to sleep. Sometimes putting ice on your head where it hurts helps, as does having Mom rub and even squeeze your head where it hurts. Good Luck! So young to have to deal with this. I love the bush! It’s just so pretty–how could you not spend your days hiding in there. Sorry to hear about migraines, but it’s so good to have a diagnosis! I suffered from them occasionally as a child, and now I get them fairly regularly (“menstrual migraine” is what the doctor calls it). I usually only have one or two per year that make me feel nauseated or send me to bed. I know that my main trigger is caffeine, and I know I should try to cut it out of my diet, but I will not give up my morning coffee! I just have to make sure that I have the same amount around the same time every day. Seems like it would be easier to just give up the coffee than to keep up with my coffee/chocolate consumption…but unless the headaches get markedly worse, I’m sticking with it! I just always make sure there is ibuprofen or tylenol on hand or in my purse. I will not leave home without it. My oldest occasionally has headaches (she’s 9), and she says they hurt on one side of the head right behind the eye, so it looks like I’ve passed on this trait…good luck with tracking Mary’s triggers. My son gets migraines but not often enough to see a pattern. I also suffer from migraine and was about 6 when I got my first one. Often when I feel a migraine coming on my son does too. Often weather and sleep related. My son gets them. I had started him on some homeopathic treatments and all of this goop was coming out of his eyes. He had blotches all over his face…definitely stuff working its way out of his system. I just couldn’t afford the cost of the treatments and had to stop them. (frustrating!) He also has had his adenoids and tonsils out. I think if I removed dairy from his diet, and had him drink tonnes of water and get very much sleep, that he’d be better. He gets them after long days at school. When he is stressed out. I am sure if I had the time i would pay very close attention to every single thing he puts in his mouth, but I can’t and he’s in school, so they feed kids all sorts of treats when we aren’t looking…sunglasses always helped me as a kid and I think I may go get him some…good luck!! With my daughter getting dehydrated, too tired or in bright sun for hours (reflecting sun–like lakes or ocean) triggers them. She has starts blinking and gets unbearably crabby. I didn’t realize she was in pain and having migraines until she asked for the lights to be turned off in her dark except for the curtained window in her room and said that her eyeball was dancing (throbbing). She starts blinking a lot. It looks like she has a facial tick. I explained this to the doctor and she was diagnosed. We really do much except catch the blinking early on with Motrin and drink lots of water, get lots of rest and try to stay calm. O friend, good luck! If you have more help/tips I’d love to know. what a precious thing! I love this little story and pictures…so sorry to hear about mary. i never knew that was possible, either. I’ll pray! At the time, it just made perfect sense! No packing and unpacking, and only one thing to take! LOL. Yes, kids can get migraines. Two of my sister’s kids get them. I think certain foods are big triggers for them. Good luck. Molly,I’ve had migraines on and off throughout my life. When they were more frequent I would take a supplement of magnesium. It really helped control the frequency of them a lot. Your bush is quite magical…I can see why your daughters want to hide out there. It’s beautiful. Look into blood sugar problems! I’m hypoglycemic and only found out a few months ago. My migraines go waaay back to junior high and headaches much earlier. As soon as I changed my diet (no sugars or starches and lots of fat and protein) my migraines disappeared for good! I’ve had migraines for years but haven’t been able to link them to anything.They seem to come in batches but I can go ages without one.Lily my eldest suffers from them too and we find the best treatment is lying down in a dark room as soon as the first symptom starts.It might be worth talking through with Mary to help her recognise the very first sign.With me it’s a change in my vision and a funny taste in my mouth. If I get lay down within a few minutes the migraine is always much shorter.Did you know that kids migraines can often manifest as stomach aches too? I know lots of my friends kids who have these. Sorry to hear that Mary has migraines. I had them as a child. Not fun. Mine started when I was around 10. I was in the nurses office all the time laying in the dark with a cool compress over my eyes. Would come home from school and sleep, eat only a tiny bit of dinner and then right back to bed. Monthly EEG’s for years – not fun. They said they would go away after I had a baby – funny, but they kind of did. I only got them rarely after having my first child. Now that I’m 43 (soon to be 44) they have come back – I think it may be pre-menopause. I’ve been worried that my children would get them too, but so far so good. I am sorry to hear about your daughter. It’s not fun and no one wants medication but things did get better. Hey Molly,I’ve been a blog reader for about 6 months now. Always look forward to reading it with my morning cup of coffee. I have a 10 yr old son who gets migraines. He was diagnosed with them the summer before he turned 5. It runs in our family, so we weren’t surprised. Here’s some tips we have picked up along the way. High humidity often triggers them. Hunger is a huge thing for us. We often travel with snacks! Dehydration, which you already mentioned. I found we had to insist that he stop what he was doing and make him drink. And finally, as soon as he feels like a headache is coming, (he also gets the visual aura) we give him a pill. Right now we are using Exedrin Migraine. We have tried special vitamins, they did nothing. The most important thing to teach them is that as soon as they even feel funny or a slight headache not to wait but to come tell you. A drink, a pill, and some rest often stops it from getting worse. Luke has learned how to deal with them, and when to get his med. and when to lay down. Summer is the worst time of year for migraine sufferers.Many times I have wanted to send you a line. 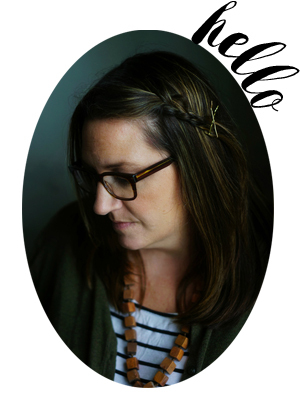 This winter I found this blog, and as I read what you wrote about being a stay at home mom, and how it is a calling and you gave Scripture references…. I ran and grabbed my Bible and sat and read as tears filled my eyes. I needed to be reminded of that and you were such an encouragement to me on that day.May God bless you and your family. Poor Mary. I started getting migraines as a teenager, and they were often linked to stress of lack of sleep, but not always. They tapered out until they were only once every few years – until I had my second child, and they’re back with a vengeance. Luckily if I catch them at the visual disturbance stage, take codeine and paracetamol and get to bed, I can at least sleep through the nasty headache part. I hope you’re able to isolate her triggers soon. i know you’ve already been given lots of advice, but here’s my 2 cents! common food additive triggers are MSG (also noted as ‘natural flavoring’ on food boxes-sneaky), aspartame, artificial colors and nitrates (like in preserved meats). common food triggers are soy (difficult to avoid, but not impossible), diet drinks, soda, brewer’s yeast and white sugar. common food allergies that can lead to migraines are wheat, egg, citrus, eggs, corn and pasteurized dairy. what i’d do is start a rotation diet. definitely just kick any junk out of the diet- don’t even worry about rotating that (the food additives). but the real foods, i’d rotate. drop them all for 10 days and then slowly add one back at a time (giving about 3 days before each new one is added). keep a food journal to mark progress and suspected triggers. my guess would be that the food additives are causing the most issues. i wouldn’t think it would be the real food. even when you look at something as simple as a plain chocolate bar you have to remember that in processing it goes through all sorts of stuff. lead is one that comes to mind. please email me if you’d like me to go into more detail about anything or help out with menu ideas. or if you just need encouragement. i know when i was making diet changes, encouragement meant the world to me! I’m wonderign if my 9 year old suffers from migraines. My husband does, so it would make sense if my son did too. He gets a cluster of debilitating headaches with terrible stomach pains (about one a day for 3 or 4 days) about every 2 months. It knocks him right out. I have talked to his pediatrician, but nothing really came from it. Maybe I’ll check that list of food triggers and see if that helps. (I feel so bad though, because I almost forget he has them until they are upon us again….) Thanks for posting this! I hope Mary starts to get some relief soon! I’ve been struggling with crippling migraines my whole life. (Or as long as I can remember) my brother gets them, my grandmother gets them, and my mother gets them. It took me a long time to admit that I needed some form of medication to control them… diet changes never worked for me, but different things can trigger them. Mine are especially bad during climate changes, pressure changes and high-stress times at work. If I feel one coming on, once you learn to recognize the symptoms, the best thing for me to do is to get a cold rag, put in on my forehead, climb into bed and try my best not to have any noise around, and darkness helps too, and trying to drink caffiene. Usually that helps, but isn’t enough to ward off a migraine, so Treximet is the only thing that works for me. I hope you get a good remedy soon! My childhood migraines were also of the low-blood-sugar variety. Our way to deal with it was lots of protein, complex carbs, & no refined sugar (small amounts of honey & maple syrup from time to time). Milk was my go-to pick me up when I felt a crash coming, followed quickly by something with peanut butter on it. The migraines disappeared once I stopped growing, as did the extreme blood sugar highs and lows. I don’t have any great advice about migraines, just wanted to offer my sympathy. Poor girl (and poor mama, too). Hang in there. Aw, poor thing with the migraines. Mine went undiagnosed until high school when they really got out of control. I’m afraid I don’t have much advice though. It seems like you have the basics. I hope she gets a little relief. Poor girl – I used to get them as a child, but mine turned out to be eyesight related. It’s well worth ruling that out. I had one migraine that rocked my world. Luckily I really tried to change my diet a bit and make water my friend and I haven’t had as horrible ones since. I had migraines when I was 10 or so, for a few years. Mine seemed to be directly connected to allergies, and I could head them off with an antihistamine and a caffeinated drink. If I didn’t catch it early enough, though, it was seeing-double brutal and required a pill. Mom tells me now that the pill was synthetic caffeine. I had migraines as a child, probably from ages 7-12; not sure when they ended. I still get them occasionally as an adult but very infrequently — one or two a year? They’ve always started off with visual auras which is helpful really because then I know what’s coming. I drink a couple cups of strong coffee, take Ibuprofen and then lay down with a cold cloth on my head and try to get to sleep before it hits. I never took any prescribed meds and never found any connection to my diet (though there may well have been — I ate a lot more junk as a child than I do now). I suspect my triggers are probably stress, lack of sleep and dehydration. No advice to offer, just wrote to let you know that I’m another who suffered as a child. Don’t know if there is any genetic component but my father and half-sister had frequent migraines as adults (don’t know if they did when they were kids). I, too, am a migraine sufferer and mine started at 15. The best things that happened for me were: 1)taking Topomax, which is topiramate. It can have crazy side effects, but those depend on the person. For me, the side effects were worth it. 2) I stopped eating wheat, which was a common food allergy that I was never tested for. Every person is different when it comes to migraines, so don’t dismiss any possible solution, as simple as it may seem. Also, be on the lookout for less common symptoms such as visual disturbances or hallucinations. I have the very rare Alice in Wonderland Syndrome and thought I was insane for the better part of my teenage years and thus refused to tell anyone I was suffering. Be sure your little girl knows to come to you with any issues and don’t dismiss any that seem outlandish. Molly, I’m really sorry to hear about Mary’s migraines. I hope you get things sorted. Just another idea maybe worth considering … a visit to your local chiropractor. My partner is a chiropractor and has helped quite a few migraine sufferers out over the years. I just did a quick web search and came up with a couple of links I thought I’d pass on to you … /www.psychologytoday.com/articles/pto-20060628-000001.html … and …www.mawsonlakeschiro.com.au/index.php?option=com_content&task=view&id=68&Itemid=86There’s lots more info out there too.Anyway I also wanted to say thanks for such an inspirational blog, I’ve been following your trials and tribulations for a while now and really enjoy what you have to say … and all your great photos too. Thanks for sharing!! I had migraines as a child also, and I agree with all the other commenters, that it can mostly be controlled by diet or lifestyle changes. As Hannah mentioned, the best thing to do is keep a food diary to link certain foods to attacks. They say cheese, caffeine and chocolate are common triggers, but it can any number of things, including stress. Mine were from stress and because I read all the time, in low light, bright light – the strain on my eyes was too much! My brother also gets migraines whenever he gets new glasses or his lens prescription changes, so I definitely recommend Mary getting her eyes checked more thoroughly. And ask about low-strength reading glasses even if her eyes are perfect vision… I used glasses just for reading and it really helped. As with most children, the migraines became less frequent as I got older and then completely stopped. I’ve had one migraine in the past ten years, and that was because I had a newborn and hadn’t slept properly in a few weeks! Hopefully you can find what triggers them for Mary and I really hope it’s just a passing thing. good luck with the migraines though…i get them myself and have since i was little..hopefully she will outgrow them. My brother had them frequently as a child and adult. It turned out his were caused by eating foods with MSG. Those big white pom poms are gorgeous can’t blame them for wanting to be in there. My migraines started when I was 13 (I’m 32 now). I also have the classic pattern — visual aura followed by headache followed by nausea. Diet has absolutely no effect on the frequency of my migraines. For me, triggers include getting off of my regular schedule, stress, dramatic weather/pressure changes, and cigarette smoke. Unfortunately, things like ibuprofen and Exedrin are pretty much useless for my migraines. I’ve had to resort to one of the prescription triptan drugs. Caffeine is a big help to me as well, if I drink it at the beginning stages of the episode. If a migraine is underway, eating ginger candy (the Ginger People make several good varieties) sometimes helps me. The ginger soothes the nausea and the spiciness sometimes eases the headache. Good luck. 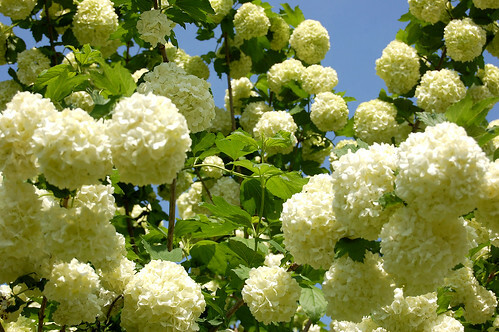 Snowball trees are my absolute favourite. This website might be of interest to you, and I hope the information can help you in some way.http://www.fedupwithfoodadditives.info/There is a fact sheet about food intolerances and migraines. It is currently being revised, so maybe you can check back. Sue Dengate’s books are excellent. My daughter is sensitive to 220 (suplhur dioxide) mostly found in dried fruits. We now dehydrate our own fruits. Have you researched homeopathy at all? I find homeopathy fantastic as a natural remedy. It has cured many an ailment in our house. Good luck in your quest! sorry to hear about mary. i’ll call you this week. I’ve suffered from migraines since I was 5 years old. Stress is a major trigger for me, as is low blood sugar. My daughter also suffers, and her triggers are fatty or sugary foods (so no cake with frosting for her…ever!) and we have to buy foods without preservatives or additives, this is actually better for our family, so it is an extra step I am willing to take. I could probably go on for hours about symptoms and possible triggers, but I’ll spare you that. One thing I will say, though, is that the earlier you can catch her symptoms, the more likely you are to stop a headache, if you wait too long, there isn’t much that can be done other than trying to make her as comfortable as possible until it passes. I hope this helps…If you have any questions, feel free to ask, I’m glad to give you as much information as I can. The story and the photos are wonderful. Migraine isn’t. I was diagnosed with that when I was seven, if my memory serves me right. At that time everyone was reluctant to give even Aspirine to children so they mostly let me cry through migraine spells. Coffee would help (there is cafeine in Aspirine, too, so that’s not really a surprise).Now that I’m an adult I still have migraines but have found adequate treatment. Mine are stress-related and I treat them with the homeopathic ‘sanguinaria’. I asked my homeopathic doctor and she told me that, not knowing the patient but keeping in mind she’s just a child and seems to have classic sympotoms, she’d recommend ‘Gelsenium homaccort’ by the company ‘Heel’ (three times a day, six drops). It’s a mixture of more than one homeopathic medecine.’Heel’ is a german company, but you could probably get their products via the Internet. If you can’t but still would like to try, let me know. I’ll help you get them. I know this post is a few days old, but I thought I would chime in with my experiences. I started getting migraines pretty young, but wasn’t diagnosed until 2nd or 3rd grade. I remember having ocular spots, going to the nurse’s office at school, and once my parents picked me up I would lie on the floor of our bathroom throwing up 4-6 times until the migraine passed. It was pretty terrible, but I do want to offer a ray of hope: my migraines almost completely went away around age 13, and it was probably related to hitting puberty. I managed to go about 10 years with none at all, and have just recently started getting them again. I now only get 1 a year, as opposed to one a month when I was little. thanks, kara. My doctor said the same, that they could go away once she hits puberty or they may be something she deals with for life. I’m praying for the former! Hi Molly,I’ve been getting migraines since age 26. Tension Headache Excedrin (w/o aspirin, just tylenol & caffeine) helps me. I get them everyday, but if I take the med soon enough, they don’t become throbbing. It is possible to get rebound headaches (including migraines) if one takes over-the-counter meds too frequently. I may have the rebound phenomenon, since not many people get them everyday. I have been pregnant or nursing for 8 years, so I can’t try any other meds. Does she grind or clench her teeth while asleep? Maybe a culprit, if she wakes up with them. They make mouthpieces for teeth grinders. Also, get a room darkening shade, as I find I’ll get them from the bright light coming into the room in the morning, even if my eyes are still closed. She should wear a hat AND sunglasses to block out glare and sun. I will almost always get one after crying over a sadstory or something. Foods aren’t a trigger for everyone. Definitely not for me. Stress is pretty universal as a culprit, and weather changes, too. This has got to be so difficult for a child so young to deal with! Sad. But God has a plan. She will grow in empathy toward others because of her suffering, in ways she never could otherwise, at such a young age. That seems harsh, but we have to remember that he works all things for the good of those who love him. I will remember her suffering when I get one, and say a prayer. Hopefully this will be short-lived for Mary and her family. I started getting migraines in college. I get them if: I am over-tired or just before my period. There are a couple of warning signs that, if I can be proactive enough, can help me ward off a full-blown migraine….sometimes my peripheral vison gets a bit hazy (that means a whopper is coming) or I just start to get a tiny dull ache behind 1 eye. What do I do….Advil/Tylenol/Sudafed combo, make sure I have something in my stomach even if it is just crackers…to ward off the nausea/vomiting that happens sometimes, drink Coke(the caffeine helps ward off once it has stated but if caffeine can cause too for some people, lie down in dark quiet room & try to sleep. I have tried a multitude of prescriptions that work for a bit then don’t….I am due to get re-checked & prescribed soon. I started having them around 11 years (my brother the same thing) I would get tingling in my handsforearms and around my mouth before the headache would set in. Chocolate was and still is a trigger for me. Going too long with eatting was another. Most of the time they came on for no apparent reason. I got them less often after puberty. SOme female relatives had them bad during menopause. One found relief with coffee – (hot coffee is the last thing I want when I have one though). Still get them now and then. Never found any meds that helped. When I was young I was given asprin/caffiene combination – never helped. I find now that if I catch it early Anaprox can help. At Whole Foods I picked up a homeopathic remedy for migraines – not sure if it helps but it can’t hurt so I take that now as well. I remember having many migraines one particular summer when I was young — laying in a dark room with cold towels on my head and just hanging on to my mom. Terrible. So sorry for your little girl. I don’t have any advice, unfortunately. 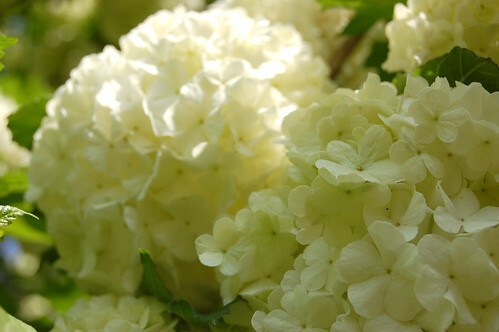 I love those snowball bushes. I really want one for our yard. They remind me of my childhood. 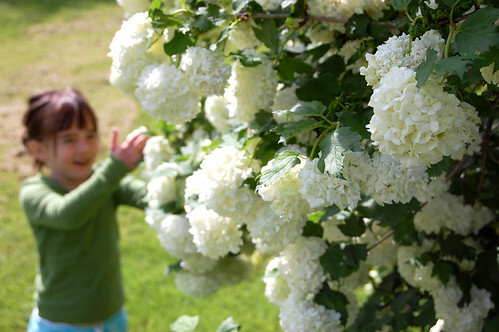 And there is nothing quite like those large white flower balls. Your kids are lucky to have a hidey place to go to. It’s a special part of childhood. I had migraines as a child and still have them in my late 30s. They are less frequent and less intense as I get older. They went away during pregnancy.I have not found food avoidance to help at all. I’ve tried it.As a child, I was on a daily medication to prevent the headaches. Don’t remember how long, etc.Now, I find Excedrin Migraine to be a miracle drug. But your daughter may be too young for asprin products. My sympathies to your child. I still remember the horrible pain. Oh, a hot water bottle on the head is soothing. I remember my mother sitting on my bed in my darkened room and telling me not to cry because it made the blood vessels tighten and the headache worse (don’t know if this is true or if she could not bear me crying anymore). Poor Mary! I fully sympathize, as I have migraines too.Actually, the children hospital at our university (Cologne in Germany) is specialized on children with migraines and bad headaches and found that some of the children had even more pain with medication (or even got addicted psychically or physically). They are now focussing on a program to teach the little patients to relax (breath control etc.) and are very successful with that. A lot of the children have less attacks and less pain during the attacks. Unfortunately, I could not find a publication in English. But maybe your doctor can be of some help with that. I have had migraines since I was a child. Before I knew the word “headache” I told my mom I had a stomachache in my head. But in the 70’s, nobody really understood them or knew what to do. The doctor told my mom to feed me a few Life Savers every time I had one. Uh… When I was a young adult, I charted them one month, went to another doctor, and got no help at all. None of the drugs available now were out yet. This was probably 1989. A few years later I took some Excedrin, because it’s what my mom had, and it went away. Years later, Excedrin caught on to people’s experiences with it and got approved as a migraine med.There are beta blockers kids can take these days, a daily med to prevent them from happening. If they are numerous enough, I would consider it for my children. I would also begin a food diary, just to see if you can find a connection. My sister in law took beta blockers as a child for migraines until she was a teenager, with much success. Then, they weaned her off, as then as a teenager, she was able to take pain medications more safely. I don’t know the name of the beta blocker, however.Strangely, my cello teacher from long ago said a lot of professional musicians in her circle took them for anxiety. Weird. My son started having migraines in 6th grade, I’ve had them since age 16. We had his eyes checked, (he got glasses which helped), florescent lights at school were triggers also. We both seem to have a problem when the pollen count is high, and can avoid migraines by taking OTC antihistamines. We both seem to be affected by changes in barometric pressure.We are huge fans of Excedrin Migraine, if we are faithful to quickly intervene at the first signs many time we can turn it around before the pain hits.The key was for my son to be able to recognize when it was coming on and to tell someone. Whenever I have a bad one, I feel hungover the next day. I hope you find solutions for your precious child. I use to get migraines. It was my hormones, they were out of whack. I had bad ones, in bed all day, the room had to be pitch black, I couldn’t stand the smell of food cooking. It was horrible, I feel her pain. Something else that triggered them was not drinking enough water. Good luck! Another thing that might help, when she feels one coming on have her sit on the edge of the bathtub, put her feet in really warm water and put a really cold washcloth on her head or back of her neck. That is suppose to help with circulating her blood or opening up blood vessels.